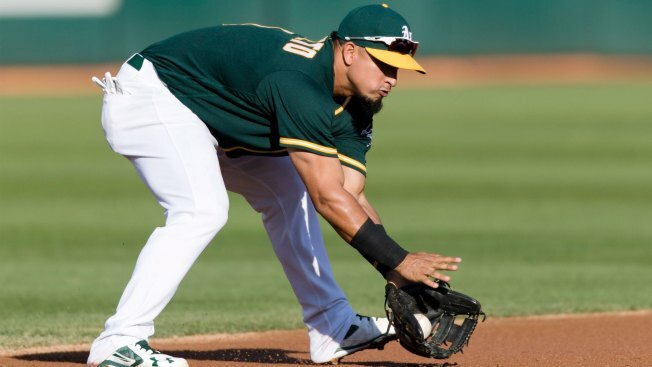 Could Franklin Barreto Get a Look in Center Field for A's? Don't count out top prospect Franklin Barreto as a possibility for the A's in center field. It's long been speculated that the middle infielder might eventually get a look in center, and the idea has at least been discussed in team circles. It's tied partially to whether the A's exercise their $6 million club option on Jed Lowrie and bring him back as their regular second baseman in 2018. Regardless, the battle to be Oakland's everyday center fielder will be one of the A's most intriguing storylines next spring. Grady Fuson, a special assistant to general manager David Forst who spends much of the season evaluating the team's farm system, discussed several of the team's center field options in the latest A's Insider Podcast. So much revolves around the health of 22-year-old Dustin Fowler, one of three prospects the A's received from the Yankees for Sonny Gray. He'll spend the winter continuing to rehab from a devastating knee injury suffered in his very first major league game in June while still with New York. The A's are hopeful he'll be ready for spring training and believe he can be a solution in center. "Fowler certainly is the guy we made this trade for, and I think everybody, top to bottom, in the system is counting on him taking that spot," Fuson said. "But we all know he's been hurt. How he comes back, who knows? Boog (Powell's) been doing a very good job for us. And there's other options." The 21-year-old Barreto, who has split time between second and short this season at Triple-A and with the big club, played some center in the Venezuelan Winter League in 2015. He's always talked with enthusiasm about the idea. The A's experimented with another highly touted young infielder, Yairo Munoz, in center field in the minors this season. "(We've) had discussions about taking Munoz out there, which we've done," Fuson said. "We've had discussions about maybe Franklin Barreto, depending on what happens at second here at end of the year, over the winter, and early in camp." Lowrie has enjoyed a very strong season with Oakland, and A's executive vice president of baseball operations Billy Beane has said the team is seriously considering picking up his option. Having Barreto be an option in center could be a way to keep him in the majors in 2018 even if Lowrie returns at second base. Fuson stressed that the idea of Barreto in center hasn't advanced past the early-discussion phase. No decisions have been made. What's interesting is that, in a short time, the A's have gone from scarce few center field options to suddenly having several. Powell and Fowler may enter the spring as front runners, but Munoz, Jaycob Brugman, Chad Pinder, Jake Smolinski and, perhaps, Barreto may all have a shot too. The A's also used their first-round pick in June on high school center fielder Austin Beck, who represents another option down the road.